UMX Quick Release Snap-On Safety Lanyards - With One Safety Breakaway On The Back Of Neck. The 3/4" wide by 36" long heavy duty quick release and safety breakaway snap closure lanyards come with 13 colors available, black, royal blue, navy blue, red, dark green, orange, yellow, pink, gray, purple, burgundy and teal colors. There are 3-locations can be easily released and closed for exchanging or add-on different hardware. This lanyard, you got 4 flexible designs featured in 1 lanyard! Simple But Flexible! 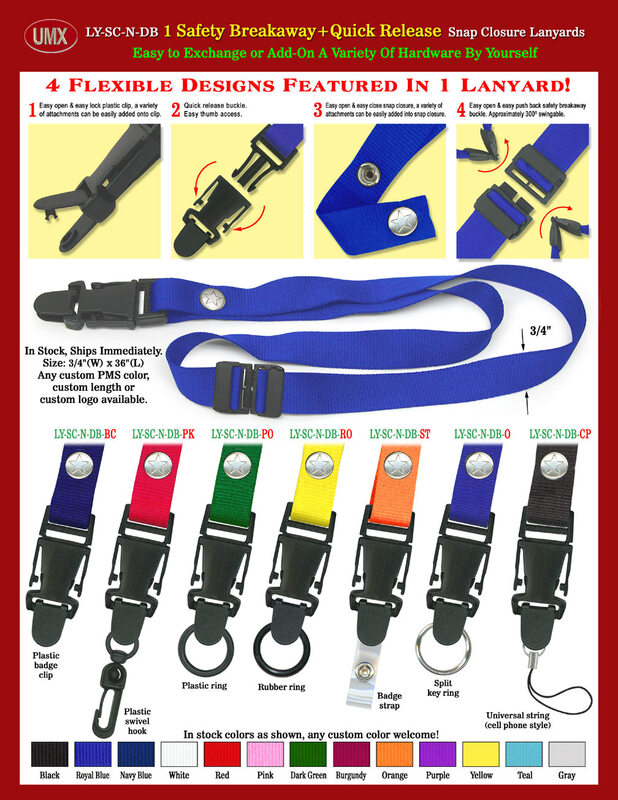 You are viewing Lanyards > Snap Closure > 3/4" Quick Release Snap-On Safety Lanyards - With One Safety Breakaway On The Back Of Neck.